Today’s update on housing construction and newly issued building permits for March brings some welcome news after the sharp declines of February. But let’s not kid ourselves: the housing market is still depressed on several fronts and today’s numbers don’t really change much. What they do suggest is that residential real estate has found a bottom. That’s not much, but it’s an improvement over the dire outlook implied by February’s reports. Privately-owned housing starts rose 7.2% last month at a seasonally adjusted annual rate. A respectable gain, but it still pales next to February’s nearly 19% loss. 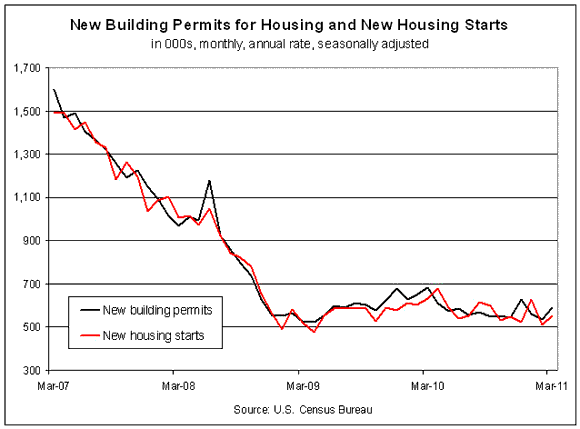 Building permits popped by more than 11% in March, the first gain for 2011. Nonetheless, as our chart below reminds, this all looks like noise in the broader trend: a housing market that’s merely coming to terms with the post-boom era of sharply lower levels of real estate development. The fundamentals of the market continue to keep a lid on the sector’s growth, and that’s not likely to change soon. This has been written about to death so there’s no point in revisiting the details again. Suffice to say, the unusually ample supply of houses for sale is a strong disincentive to bring new homes on the market. Working off that inventory is going to take years–even at this late date. Sure, there’ll be periods of growth at the margins and eventually a broad upswing will take root. But as a general trend, housing’s likely to tread water for the foreseeable future. The good news is that the longer the trend in housing starts and permits move sideways, the higher the odds that the correction in real estate really is history. Today’s numbers offer a bit more reason for thinking optimistically. For the moment, however, that’s about much blood as you can squeeze out of this stone. If you’re really disposed to see the glass as half full, perhaps you expect that housing starts and building permits make some modest progress over the next year or so in climbing out of their respective holes. But much depends on how the economy fares in general, and the labor market in particular. Recent reports suggest reason for mild optimism, but here too the outlook calls for much less than what’s needed to repair the damage quickly from the Great Recession. Meanwhile, early clues of an approaching rebound in real estate worthy of the name will be conveyed in prices. “We’re going to have to see an extended period of stable prices before we see a meaningful pickup in sales, and we need to see a good pickup in sales before we see active building,” reminds Michael Moran, chief economist at Daiwa Capital Markets America. 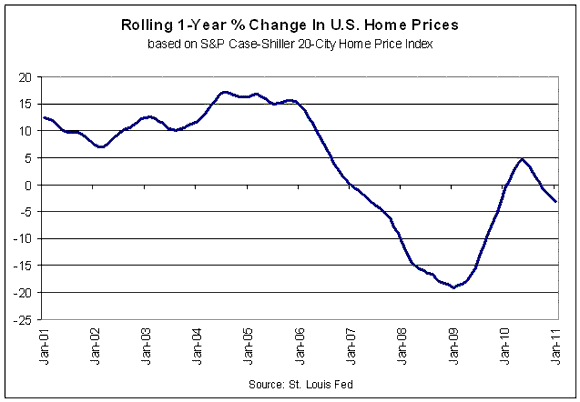 Hope springs eternal, but it’s not obvious that prices are set to stabilize, much less rise. Fortunately, the lack of a revival in real estate’s fortunes haven’t derailed the broader economy’s revival. As such, the expectation that the danger of a new drop in the housing market is receding is more than a statistical curiosity. For the time being, that’s about as good as it’s likely to get when it comes to housing. Of course, if you’re a buyer, this is a golden age. Then again, if recent suffering in the housing market hasn’t brought higher prices, or at least a powerful rebound, it’s hard to imagine what will given the current realities of the macro outlook.